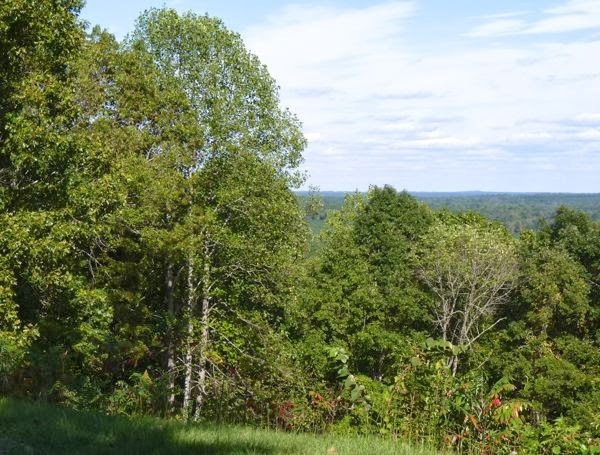 The Natchez Trace Parkway is actually a National Park that extends from Nashville TN to Natchez MS. A nice two-lane highway meanders through forests and meadows at a leisurely pace. It approximates the path of the original trace, and occasionally crosses it. No commercial traffic is allowed, and usage was very light so it was a pleasant ride. 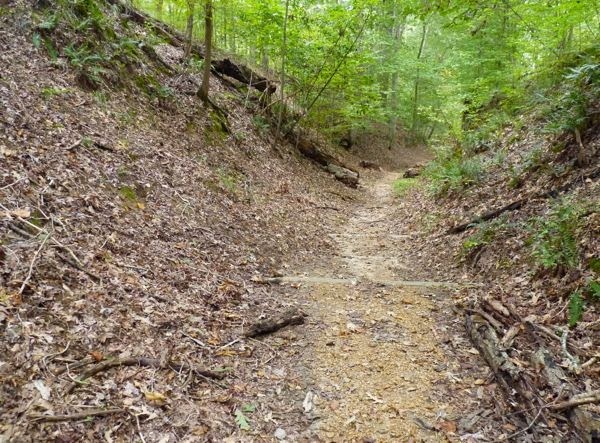 My first stop along the Trace was at Tishomingo State Park. It had nicely spaced paved sites around a small lake. I spent one day inside because it rained the whole time that first day. But, I did manage to get some computer work done, and some reading. I spent another day hiking some of the trails. Basically a leisurely walk through the woods without much of interest. 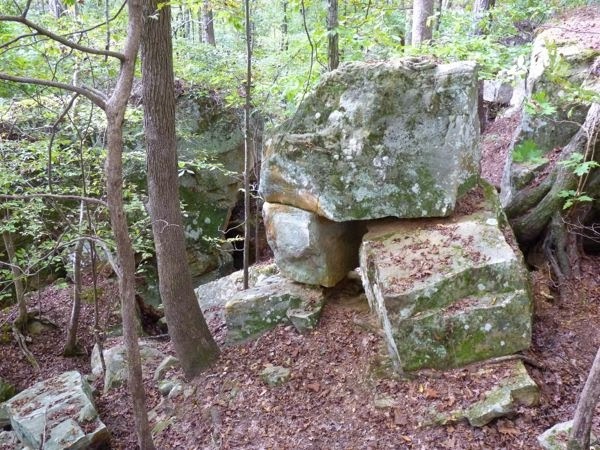 Except for these rocks which were claimed to have been used by the Chickasaw when they took this trail. 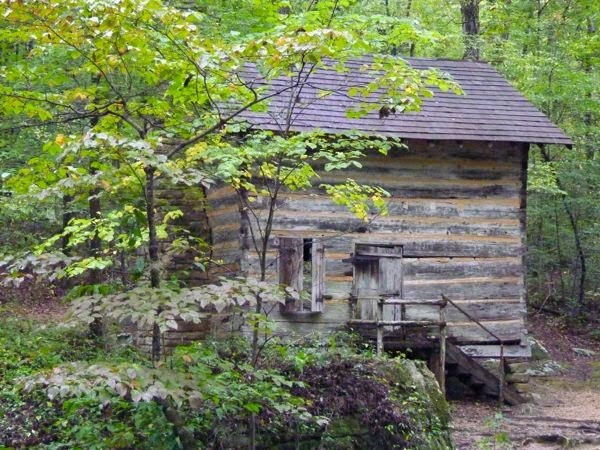 On my way out, I drove to the other end of the park where I found a log cabin and pond. This park was built by the CCC, and further on were structures they had made. However, it started raining again, so I decided to leave. I stopped at a wayside and hiked a short way to the Old Trace (the original real one). At that spot there was a small burial plot with headstones for Confederate soldiers. The names faced the trace so those passing by would remember. My next stop was near Tupelo MS at the Parkway Visitor Center. It had interesting displays of the history and use of the trace over the years. Descriptions of wildlife of the area, and of the different Indian tribes that once lived there. Another stop was made at the site of a former Chickasaw Village. The only thing there was a display of what they thought it looked like, and indications of where the buildings would have been. I arrived at Jeff Busby CG around 2:30pm; in time to snag a nice free site before other RVs came rolling in. I was able to get level without using blocks, and it was away from the restrooms and more popular sites. Since the price was right, I stayed for four days. There really was not much to do there. I did hike a trail, through the woods, to the top of Little Mountain and took some photos. Not sure I would call it a mountain, but it was the highest point in the region. On the next leg, I stopped briefly at French Camp where the French army camped during their war with the Indians. I then stopped off in Jackson MS to resupply and refuel. I also ate lunch, did some internet work and checked my route for the next week. 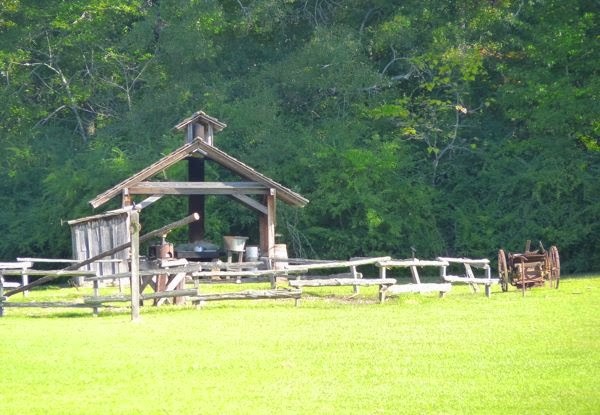 The next camp was at Rocky Springs CG along the parkway. Arriving at 3pm I was able to get a nice site near the back side of the loop. This is another free campground with paved large sites and restrooms. To me all sites were really nice, and well spaced. A hike took me for about 3/4 mile on the original trace. The trek had me thinking about what the Kaintucks might have felt like taking this route. The high embankment signaled to them that they were approaching the Rocky Springs settlement. After three days, I left early in order to make my next camp at a decent hour, and to pick up a few things I forgot to get. 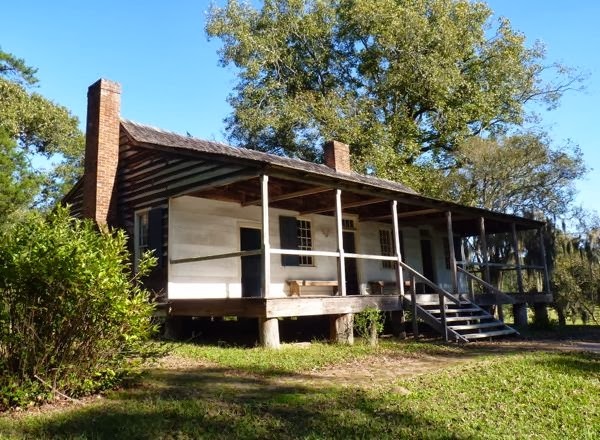 But, as I neared Natchez, a couple more historic stops on the parkway were in order. 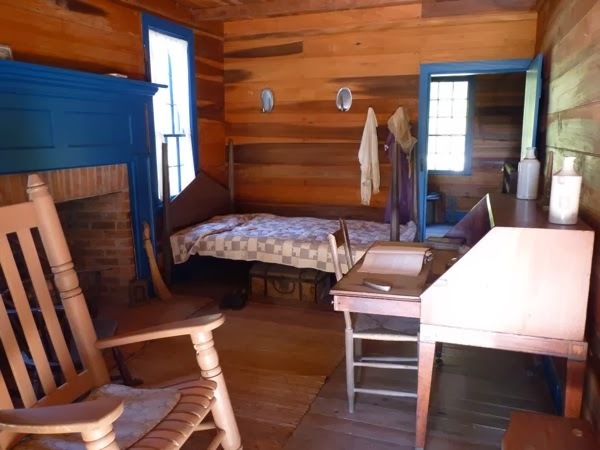 Mount Locust was a plantation on the trace, and provided an inn for travelers with rooms to rest and a hot meal. Reaching this point meant they were almost to Natchez. It is the only “stand” (rest stop) remaining. This was the most developed and interesting of the historic waysides. The final stop was at Emerald Mound, the largest on the trace and the second largest in the USA. 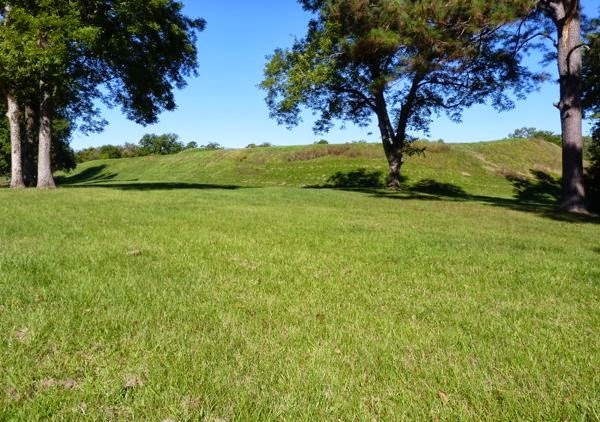 Used by ancestors of the Natchez it is eight acres at the top which, at that time, held a village. It was much taller than it appears in the photo, but too large to get a decent picture of the whole. 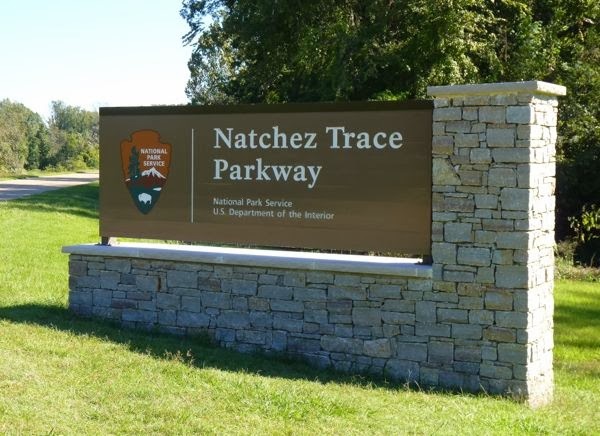 The Natchez Trace Parkway has many historical waysides, but few with anything other than a sign describing why the location was significant. Despite this, I enjoyed my time along this historic roadway to what was then considered the southwest of the country. Thanks for commenting Sara. Glad you enjoyed it. Your post about the Trace encouraged me to take this route on my way west.